Trombonist and composer Jenny Kellogg’s musical career has taken her around the world to China, England, Italy, and Peru. Jenny participated in Betty Carter’s Jazz Ahead Residency Program at the Kennedy Center for the Performing Arts, the Stean’s Summer Music Institute at Ravinia, and she played lead trombone in the Disneyland Resort All-American College Band. 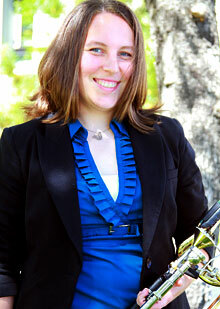 From fall 2011 to spring 2013 she held the solo trombone chair in the Grammy-Nominated One O’Clock Lab Band. The Lab 2012 and Lab 2013 albums feature her large jazz ensemble compositions. She writes on a regular basis for high school and college level jazz ensembles throughout the Northwest. Jenny holds Bachelor of Music degrees in Trombone Performance and Music Composition from the University of Idaho and a Master of Music degree in Jazz Studies from the University of North Texas. Jenny plays in the Spokane area with the Spokane Jazz Orchestra, Bob Curnow Big Band, and Brassworks Northwest. She is a regular substitute in other musical organizations such as the Spokane Symphony Orchestra. She is currently Director of Jazz and Trombone Studies at Eastern Washington University where she directs the top EWU jazz ensemble, the EWU Concert Jazz Orchestra, and hosts the EWU Jazz Dialogue Festival. Jenny is in great demand as a guest artist and clinician throughout the US and Canada.